Figure 1. Young vines hilled up with soil properly covering the graft union. Winter injury is the single most limiting factor to grape production in the Northern United States. 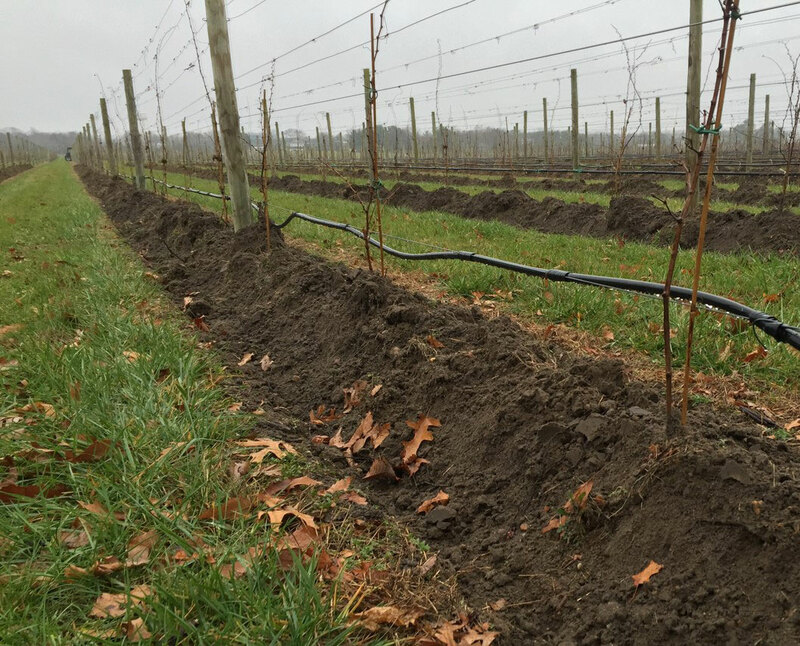 In New Jersey, 85% of vineyards reported winter injury following the harsh winters of 2013–14 and 2014–151. Extreme cold, widely fluctuating temperatures and late freezes can all cause direct injury to grape buds, trunk and stem tissues. Such injury creates opportunities for infection and development of crown gall disease, caused by Agrobacterium vitis. Crown galls typically form on trunks and graft unions, restricting water and nutrient movement from the roots to the canopy, often resulting in vine decline or death. Cold injury and crown gall disease occurs in all types of varieties, however, Vitis vinifera are more susceptible to cold damage compared to hybrids and natives. Young, vigorously growing vines are especially vulnerable to cold injury and, for them, protective measures should be an especially high priority. Also, some varieties like Merlot and Sauvignon Blanc for example, are particularly sensitive to winter injury and may need to be protected even when well established. Figure 2. Grape vine in year after hilling and damaging winter. Notice graft union and trunk a few inches above it unaffected by winter damage due to hilling-up, while unprotected trunk is showing symptoms of crown gall. Many cultural practices can be employed to manage the risk from winter injury (training vines to multiple trunks, delaying dormant pruning, etc.). One particularly useful way to reduce winter injury is to protect the graft union from the cold. When a graft union is damaged, the vine is usually a complete loss, as the scion variety either dies immediately, or declines over years. However, if the graft union is protected (Fig. 1), it is possible to replace damaged trunks with regenerated shoots arising at or just above the graft union (Fig. 2). Hilling-up, a practice of covering the graft union using soil, is one of the most effective methods of preventing winter damage. 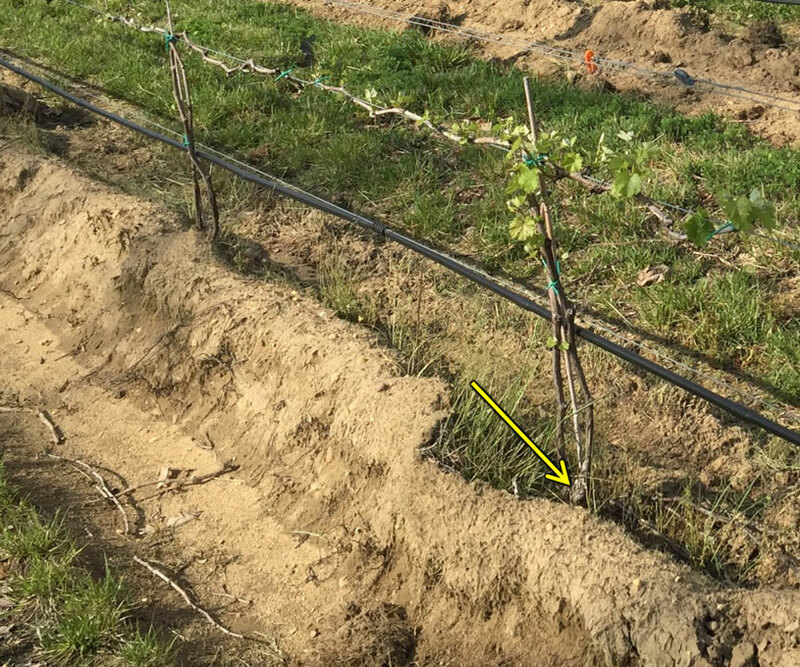 Soil hilled-up around the vine acts both as a thermal mass that holds heat, and as an insulator that slows heat loss during extreme cold temperature events. By using the soil available near the trunk base, growers can improve long-term survival of the vines. If the mound is big enough to cover 3 to 4 inches above the graft union, the temperature experienced at the graft union is typically close to subsurface soil temperatures. 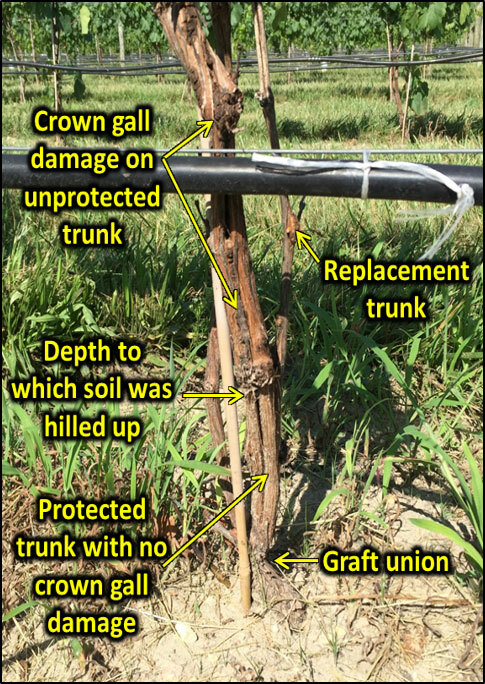 Studies show that temperatures under the hilled soil can be significantly warmer than air temperatures, protecting the graft union from damage (Fig. 3).2 In these studies, temperatures around 32°F were recorded at the graft union when hilled-up, while the air temperature a few inches above the soil mound was around 10°F, low enough to damage the vine (Fig. 3). Figure 3. Temperatures (°F) recorded near a hilled-up vine on a cold morning. From Zabadal, et al. 2007. Hilling-up can be done manually or mechanically. Tools specific for hilling-up are available, however, existing farm machinery can also be adapted for this purpose (e.g., vegetable tiller, single plow, disc harrow, etc.). For hilling-up, a hoe can be front-mounted, tailed, or side-mounted. One-sided hoes are easier to operate with higher accuracy compared to two-sided, which require very straight rows. The potential for damage to vines is higher with a less skilled tractor operator. The goal for the hilling-up is to create a soil mound of 3–4 inches above the graft union. Depending on the soil type, levelness near the base, and soil moisture during hilling-up, two or more passes may be required to effectively cover the majority of the graft. Vines with uncovered graft unions after the second pass may not have been planted at the right depth. Although a machine like the one shown in Fig. 4 can cost up to $7,000, it is less than the cost of re-planting an entire two-acre vineyard. Single blade plows or hoes are the simplest and least expensive implements, however, a single pass may not throw sufficient soil to cover the graft union. The use of narrow bladed plows or hoes requires special skill and technique to create adequate volume of soil for coverage without creating clods. Avoid digging too deep with the use of any tool to avoid damage to the top roots of the vine. A specialized implement with a single notched disc (Fig. 4) can prevent clod formation. Normally with two passes, this single notched disc can be as effective as a 2- or 3-disc plow. Figure 4. Front-mounted specialized rotary implement for hilling-up grapes with gauge wheel. Hilling-up is recommended during early fall, shortly after harvest. Avoid hilling-up in the late fall to avoid hard frozen ground that is more difficult to till. The right time for hilling-up is when the soil is not frozen and neither too dry nor too wet, and easy to work. 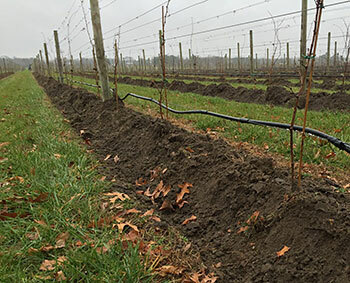 Soil with large clods will not form a solid continuous mound necessary to protect the vines. Raise your drip lines before hilling to a sufficient height to avoid damaging them. Crooked or bent trunks are prone to damage from the hilling operation and should be tied straight before hilling. Hilling-up requires care to make sure that the graft union is well-covered (Fig. 5). One can easily damage the trunk if the equipment touches the vine and creates a wound that may provide a point of infection for crown gall or exacerbate the potential for cold injury. 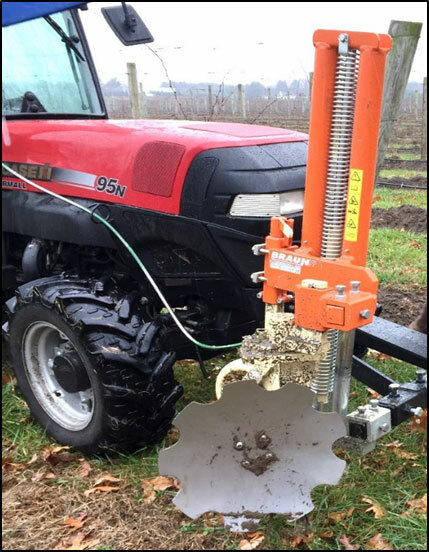 Later it may be necessary to use a shovel to throw sufficient soil to cover the graft union on some of the vines, despite good mechanical hilling-up practice. Taking down the hilled-up soil requires even more care and often more labor than hilling-up. 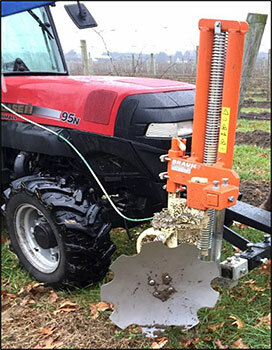 Specialized implements with rotary brushes are available for taking down hilled-up soil around vines. Remember that crown gall-causing bacteria are ever-present in the vines and take advantage of callusing or the recovery process after injury. Damaging the vines during hilling-up or taking down can be counterproductive and result in crown gall infection. Figure 5. Example of poor hilling-up. 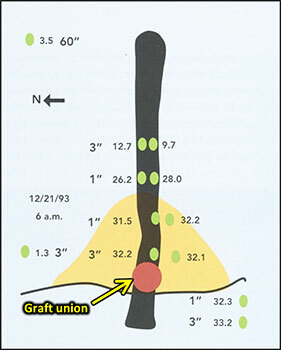 Notice that some graft unions are not covered with soil. Taking down the soil in the spring is also necessary for weed management and to prevent the scion from rooting into the soil above the graft union. If you normally use a fall preemergent herbicide application, it will be necessary to alter your spray regime since the soil disturbance caused by hilling-up in the fall and taking down in the spring will diminish or eliminate the effectiveness of fall pre-emergent herbicide. Project sponsored by the USDA-NIFA Beginner Farmer and Rancher Development Program.